We are a private-billing practice. When you come to your psychotherapy appointment you pay us by cash or card. We can then put in your Medicare rebate claim on your behalf. This means you don’t have to go to a Medicare office. Medicare will deposit your rebate into your account within 24 hours. 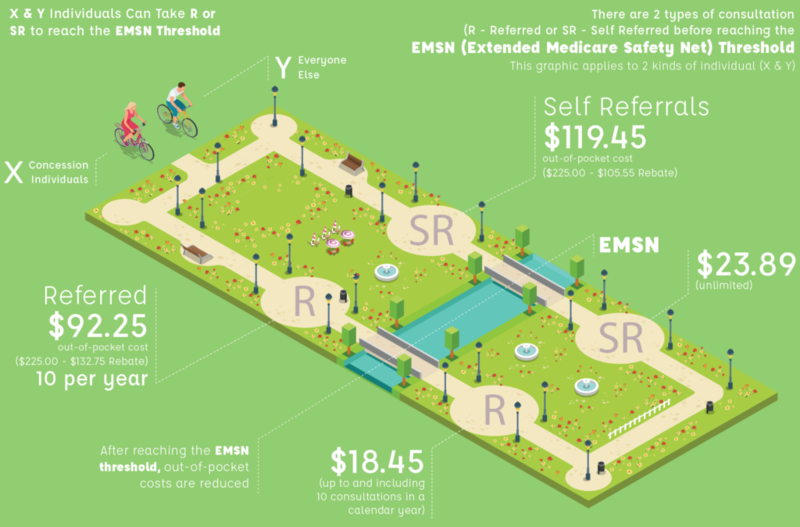 The infographic below shows your out-of-pocket expense after getting your medicare rebate. Please note that your out-of-pocket expense is reduced once you have reached the medicare safety net threshold. Non-concessional patients reach the Medicare Safety Net Threshold for out-of-pocket costs after 18-21 psychotherapy consultations with me. Concessional patients will reach the threshold within 6-8 consultations. If you have had other out-of-pocket costs for attending your GP or psychiatrist you may have reached the threshold already!